Adrienne of the Rich Life On A Budget and her husband Bill. Being as it was our first time meeting in person..
it called for a perfect table scape. I knew I wanted to keep with my summer decor scheme of blues and whites..
where your eye can travel inside to out with the first step inside. Styling a party is always my favorite part of the prep. so I am able to enjoy the creative process. I pull all of the elements I am thinking of using out on the table. all to be accented by my Mexican turquoise goblets. 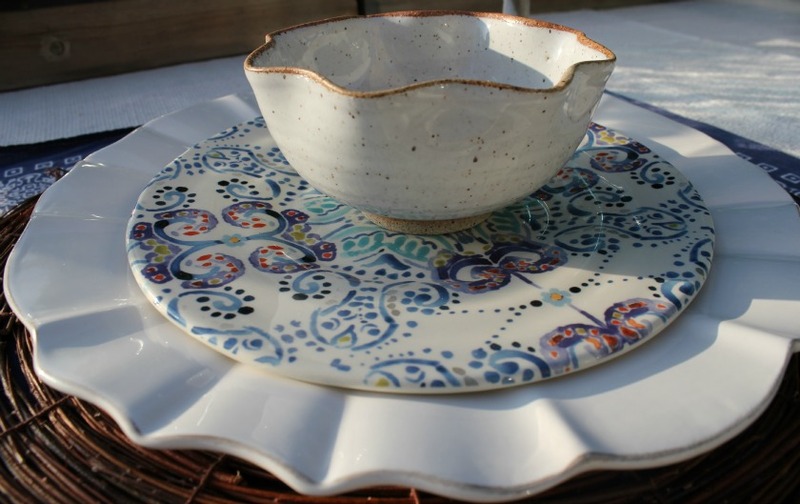 for some small neutral bowls..
a summer alfresco dinner in the backyard. 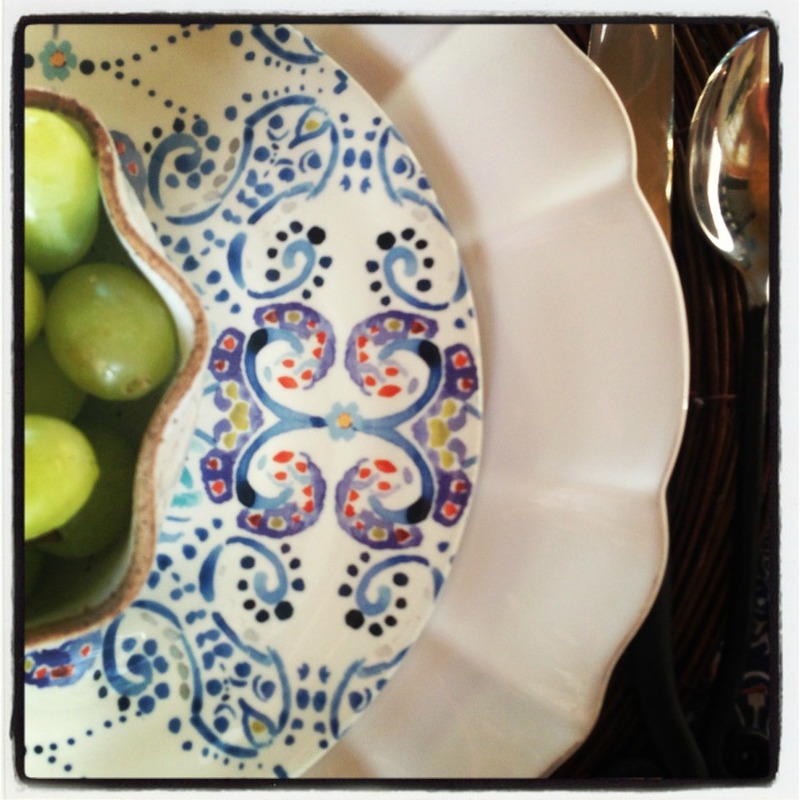 mixing in a different salad plate at each place setting for visual interest. it is made up of several cotton rugs from pottery barn. Having it always on... we have dinner there almost every night we are home in the summer. In the morning when I water the garden.. I just hit it with the sprayer... so cleaning it is a daily breeze. topped off with a small bowl brimming with green grapes. 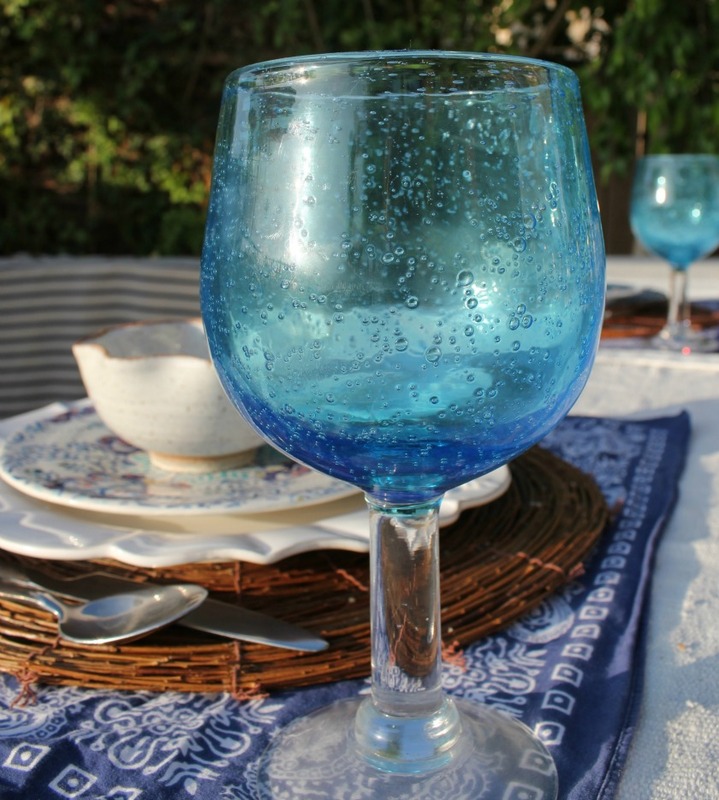 These can easily be rearranged to serve dinner family style in the center of the table. She is even more beautiful, warm and kind in person. has just been moved to the top of our next travels list. Thank you Adrienne and Bill for a most marvelous summer night. and the great connecting and friendships that can come from it. This week, I finally opened a Facebook page for my shop. To celebrate this feat, I will be doing a giveaway of one of my fabulous Howlite Bracelets, which can be seen here. To enter, like my Tamera Beardsley Design Facebook page here. The giveaway will be open until Saturday, August 3rd at 3:00pm. One winner will be announced on Sunday, August 4th on my wardrobe post! 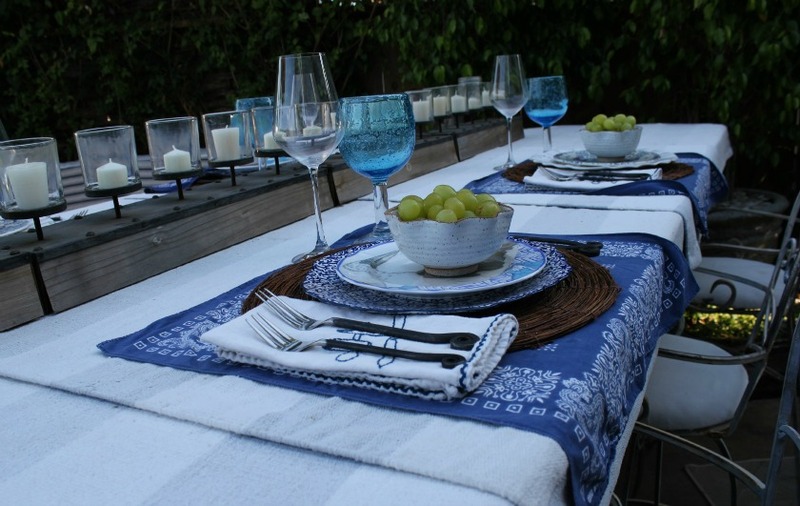 Tamera, your table setting is stunning! Aren't Adrienne and Bill just the nicest people? Thanks Vanessa... loved your blue round up today! 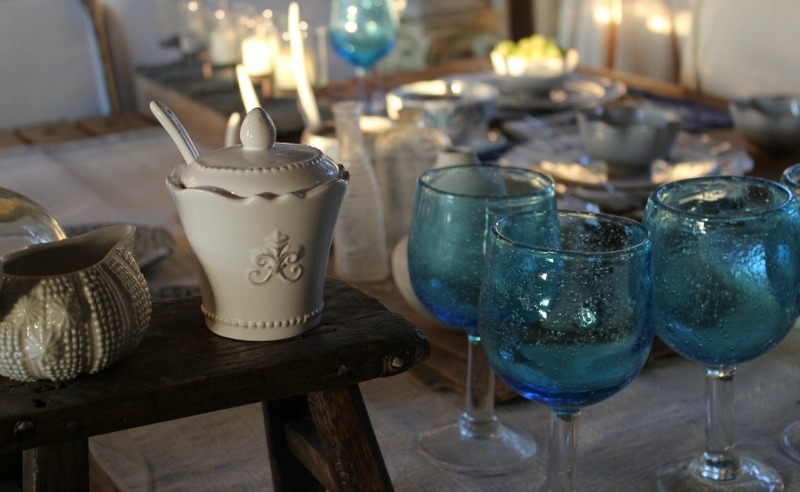 Such a beautiful table setting, I love the oceanic influences. And you look fabulous in your graceful black and white! Thank you dear Emalina for your kind words and for traveling from your world of enchantment to visit. 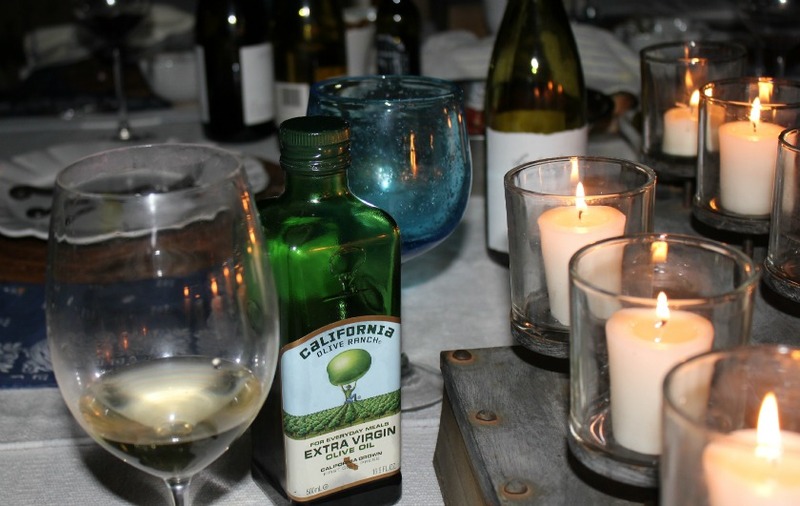 Always a joy to meet fellow bloggers, and your table setting looks really beautiful. You put so much thought and effort into all your styling, Tamera - my life is just thrown together in comparison! Thank you for your kind words Curtise! Yes, it is so wonderful to meet friends in person. Enjoyed seeing your English town in your last post.. do enjoy your summer holidays! Tamera dear-what a gorgeous evening you created for Adrienne and Bill. 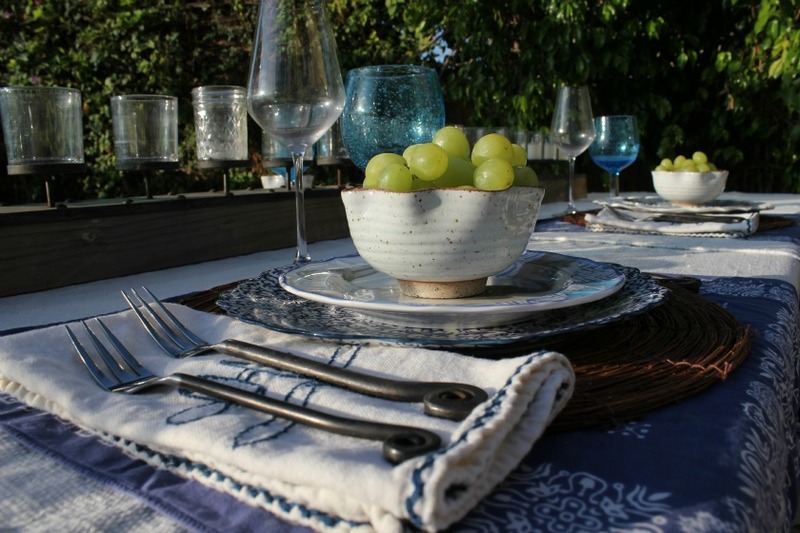 Your tablescape is true casual elegance and the perfect setting for a lovely meal and conversation. I'm excited for you both as we all know how deep the connections are that we make in blogging-even though we have never met in person. Well, know two of my favorite blogger friends have met. I almost feel like I was there in your garden. What a lovely glimpse and thank you for sharing this special evening. PS-You both look gorgeous by the way! My goodness you have set a divine table...with such artistic flair. 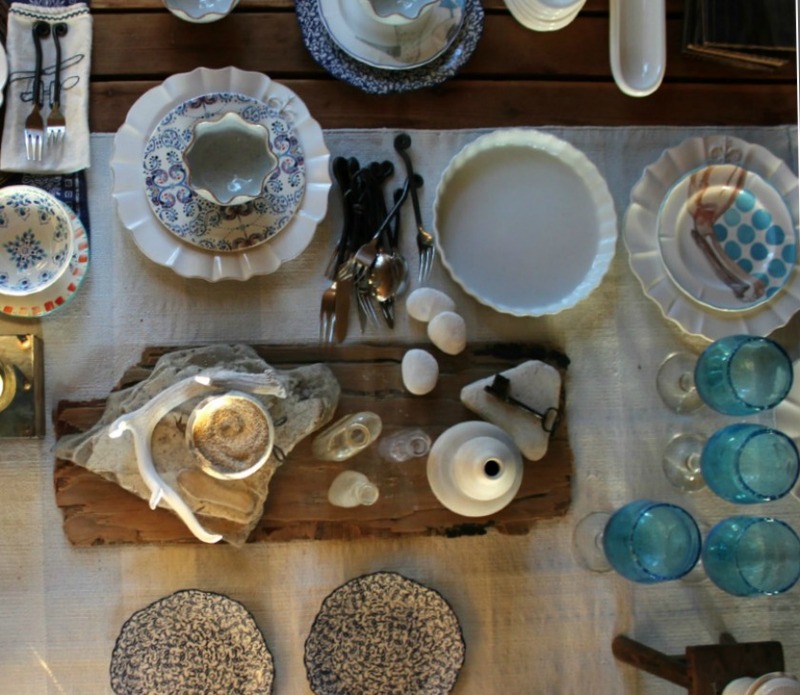 Your talents for creating jewelry are spilling over into tablescapes. I would have loved to been privy to the menu and the conversation. BTW you both look gorgeous in your maxi dresses! Thank you dear Hostess for your kind comment and for visiting from British Columbia! I so enjoyed your garden share... your hard work is evident in every corner. How much fun...two of my favorite ladies together!! Looks like the entire evening was stylish and special!! Thank you Pam! Happy Birthday to you... you make 60 look terrific!! I just LOVE your table setting! The bandanas is genius! So fun you were able to meet up IRL. Looks like an amazing evening. 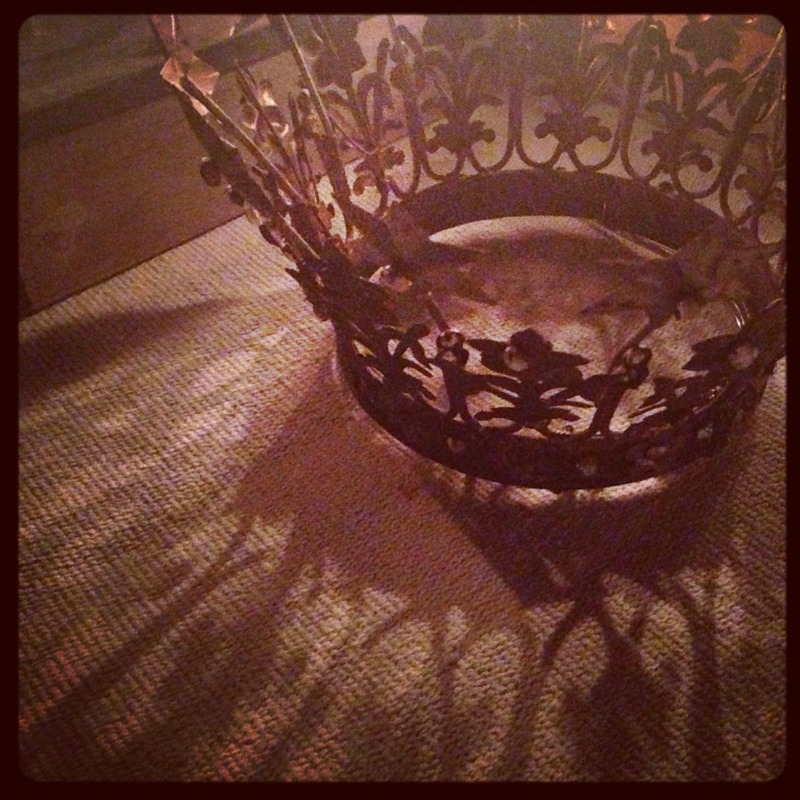 Thank you Suzanne... it was truly an enchanted evening. I could have sold 30 bracelets this past weekend...my wrist was the center of attention on an eve out with my group of sorority sisters. Get busy in the studio! It :could just er your year! Barb thank you for your kind words... you are always so very giving. so happy to hear your bracelet was a hit... and yes I do need to get in the studio. Thank you for the encouragement! So happy you were able to go out and have some fun... during such a trying time. Hi Jill! I woke up this morning realizing I needed to pick my casual party outfit to wear tonight... so I can have a photo to participate in your How I Wear MY event. I so enjoy participating and seeing all of the stylish women who participate! Thank you so for your kind comments my dear! Oh Tamera, this is just awe inspiring. I can truly relate to your emaculate preparations, done with such tender loving care. I believe the time spent prepping is a gift in and of itself to the recipients and they can truly feel it the minute they enter your home. Your attention to detail and your surroundings is amazing. You two women look so radiant, and the happiness of the evening definitely is shining through. I must add, I love your 'little field trip to anthropologie' it made me giggle all morning (only because I can't tell you how many times I have done the exact same thing), made my heart sing with joy that I have a fellow sister blogger who thinks and acts like myself. I do believe my husband needs to know that he, too, is not alone in supporting this entertaining habit. It's probably a good thing we don't live by one another, we could get in a lot of trouble or we could have a whole lot of fun. Thank you dear friend for sharing this incredible evening with us, as I have said before, TIME spent with friends is the most precious gift we can give. What a magical evening we had together! You outdid yourself with such a beautiful table setting, wonderful food and lively conversation. Looking forward to seeing you again later this year! So beautiful and inspiring! Art and creativity can be applied in every area of our life and can be found everywhere we look. What a great way to live! 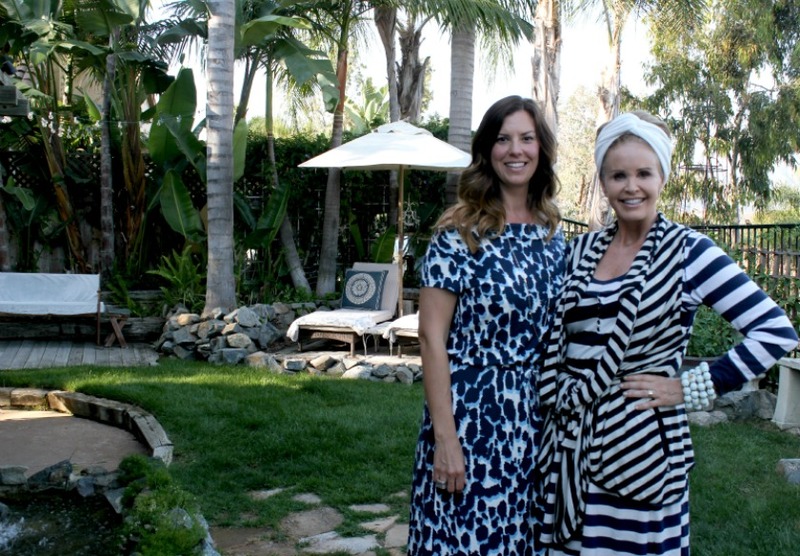 I am so happy to see you here, in your gorgeous garden, with a BLOGGER FRIEND! Isn't it thrilling to finally meet the people with whom you have made so many connections? We often make more connections with bloggers than we do with people in our midst and I'm convinced it's because we share more of ourselves when we compose on-line. Oh how beautiful you all look, and your table, so StUNNING! Thank you for leaving the only words that can ever stay with an artist: THANK YOU. I imagine it has been wonderful meeting the gorgeous Adrienne and her husband! Two beautiful ladies and your garden and the table setting are heavenly. 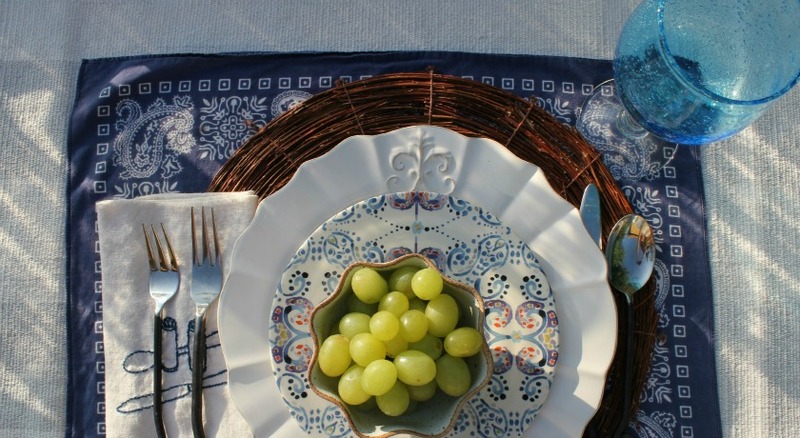 Absolutely lovely - I like how the roundness of the grapes matches the undulating curves of the grape bowl. Your table looks so inviting! 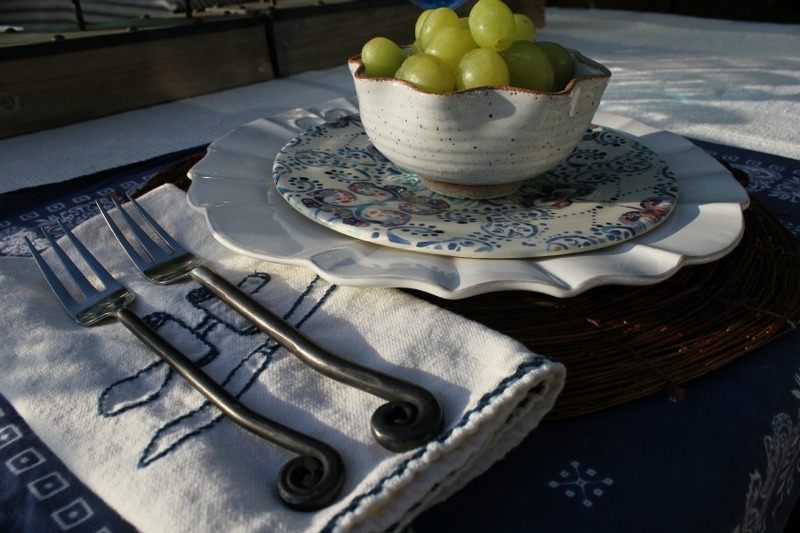 It's such a treat setting a nice table if you have the right pieces - and yours is perfect! How nice that you met Adrienne, and lucky her to have have such a gracious hostess. Two of my favorite fashion bloggers in one place -- how perfect! 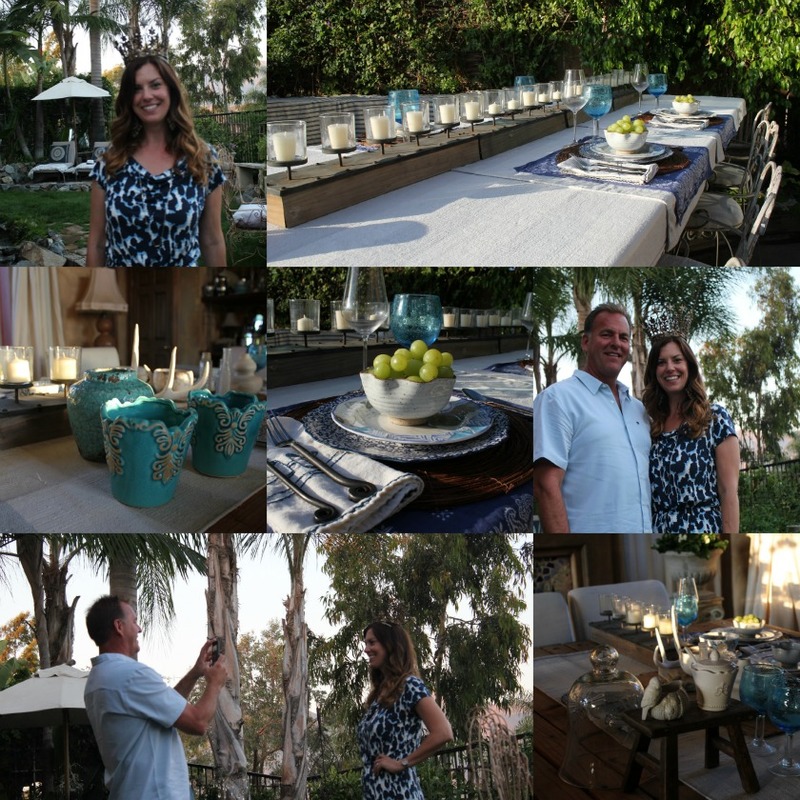 Great looks on both of you and a beautiful tablescape, Tamera. Love the patterns. You both look great. You're both Psychic-Intuitive Long Distance Print Mixers! How lovely you both look, and together are a dynamic duo of the first order of gorgeousness! Beautiful table, of course ... what a wonderful evening must have been had by all. Oh, to have been a fly on the wall. With a video camera! It sounds like the perfect summer evening. 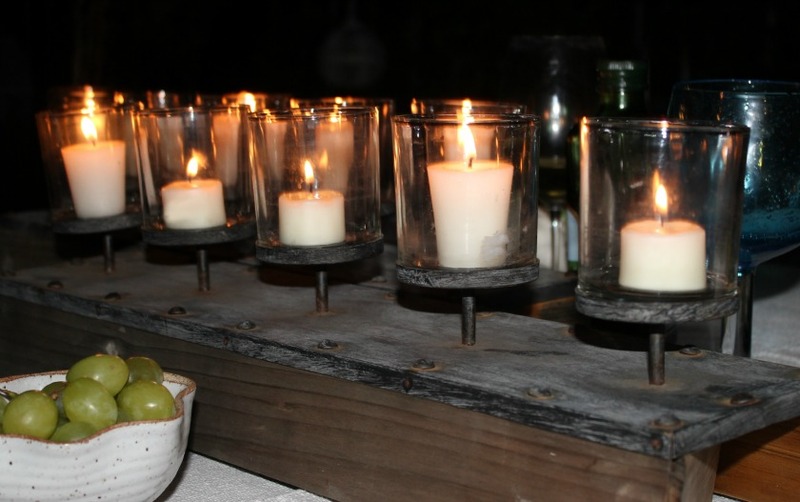 Your decorating is spot on for creating such a romantic venue. I really love those turquoise goblets!